A few years later when someone will read my blog, they will come to know that contrary to what you read on the various blogs, it is actually difficult. This blog has become so meandering that I have started feeling ashamed writing blogs after huge intervals of more than a month or so. 1. I have not stopped my endeavour to become a good programmer. 2. However, shamed I am on my exploits, I still do write on this blog. I enrolled for CS253 - Web Application Engineering class of Udacity . 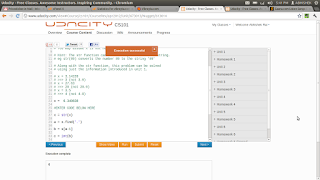 If you are reading this blog then I shall assume that you already know about Udacity. They have certainly made this world a better place. Unit 1 is comparatively easier for anyone who has even a slight idea of programming, so it was not very difficult to complete the quizzes and the course. The difficult part was to complete the Homework 1.